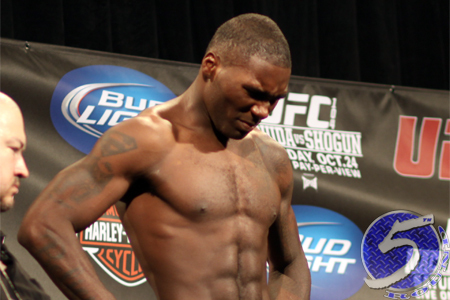 According to Glenn Robinson of Authentic Sports Management, Anthony Johnson (Pictured) was on pace to make weight for his middleweight debut against Vitor Belfort. However, Robinson claims the weight cutting process caused his client to become ill three hours before tipping the scales on Friday. Johnson was urged by a local doctor to ingest fluids to rehydrate. He was just 1.5 pounds away from hitting the required mark at that time. While consuming liquids helped Johnson recover, it wasn’t the best solution for a fighter trying to shed last-minute pounds. By the time “Rumble” was back to normal, it was too close to the weigh-ins for him to resume his weight cut. Johnson proceeded to hit the scales at a whopping 197 pounds, 11lbs. over the limit for a non-title middleweight bout and what Belfort checked in at. UFC president Dana White ripped him for his “unprofessional” behavior. Regardless, Belfort agreed to keep the fight as long as Johnson doesn’t weigh-in at over 205 pounds tomorrow. Robinson was confident his client will be on his best behavior. Although Belfort will enter their shootout at a disadvantage, he will benefit financially by pocketing 20 percent of Johnson’s “show” purse for missing weight. Johnson is certainly no stranger to drama on the scales. He weighed 177.5 pounds in his September 2007 contest against Rich Clementi and was 176 pounds for his October 2009 scrap with Yoshiyuki Yoshida. Both welterweight bouts were fought at catchweights based off Johnson’s respective weight. Three hours after weigh-ins, Mike Dolce, Belfort’s dietitian, tweeted “The Phenom” had already ballooned back to a healthy 205 pounds. UFC 142 takes place Saturday inside HSBC Arena in Rio de Jenairo, Brazil. The “middleweights” will co-headline the pay-per-view broadcast.